"For explosive results." Indeed, Michael Bay. 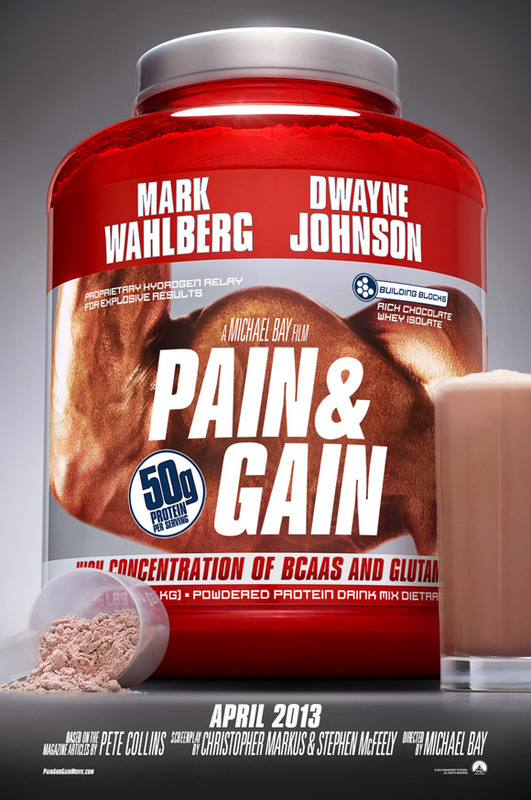 To go along with the announcement of an official April 2013 release date, Paramount has unveiled a teaser poster for Michael Bay's new film (not involving robots from another world) titled Pain & Gain. We've been hearing about this for a while, since it's apparently Bay's "smaller" drama starring Mark Wahlberg and Dwayne Johnson as two bodybuilders in Florida who get caught up in a kidnapping scheme that goes terribly wrong. Besides set photos, we don't have a first look at them yet, however this hilariously fitting poster of weight gain products should hold us over until a trailer. Pain & Gain is directed by the one-and-only Michael Bay (Bad Boys I & II, The Rock, Armageddon, The Island, Transformers) from a script co-written by Christopher Markus & Stephen McFeely (Chronicles of Narnia, Captain America) and Scott Rosenberg (Con Air, High Fidelity, "Life on Mars"). The original idea was based on an Miami New Times article by Pete Collins. Bay filmed Pain & Gain down in Miami, Florida earlier this year. In addition to Johnson & Wahlberg, the cast includes Rebel Wilson, Ed Harris, Anthony Mackie, Rob Corddry, Ken Jeong, Tony Shalhoub and Kurt Angle. Paramount will be releasing Pain & Gain starting April 26th, 2013 next spring. We'll keep you updated on any trailers or official photos from here. I going to pump...you up! Very nice Hanz. Now show all the girly men your rippling muscles. Yes. Thank you grimjob, I can always count on you! Alright I'll give Bay a chance on this one but I ain't redeeming him for ruining Transforners and TMNT this soulless destroyer of childhoods! Adding to that keep Bay to smaller films like this steer him clear from our childhood! So you've already seen Ninja Turtles? Clearly you must have since you've already decided he has "ruined" it. Is this something new for Michael Bay to make a movie based on a true story? A remarkable change or transformation is probably done by Mark Wahlberg to fit the character of this movie. Ugh, that iron is heavy! I am looking forward to this. But I admit that when I first read the article the movie is based on it just sounded like a perfect fit for the Coen Brothers.